On this page we will look at out top 10 gardening tips for growing tomatoes. First of all let's explain that in temperate climates the Tomato is an annual plant whilst in the tropics they are likely to be short-lived perennials. Probably the most popular Tomato gardening plant amongst vegetable gardeners is the Cordon standard which comes in varieties such as 'Alicante', 'Golden Sunrise' and the wonderfully named 'Tigerella'. 1. Be aware of growing conditions and especially temperature. A Tomato plant grows best at between 70-75 degrees Fahrenheit but perform poorly below 60 degrees Fahrenheit and above 80 degrees Fahrenheit. 2. Tomatoes are deep rooted plants so always plant at least 12 inches deep and use lots of mature compost. 3. Before planting your Tomato plants always apply fertilizer. 4. Don't worry if you have only very limited room available in your garden or plot as Tomatoes grow very well in containers. 5. Tomato plants will respond well in all sorts of soil as well as it is well drained and fertile. A pH value of the soil in the 5.5 - 7 range is preferable. 6. Plant semi-determinate plants such as Cordons in single rows with an 18-20 inch gap between rows. The plants themselves should be spaced at least 15 inches apart. These distances can of course be reduced for dwarf varieties. 7. 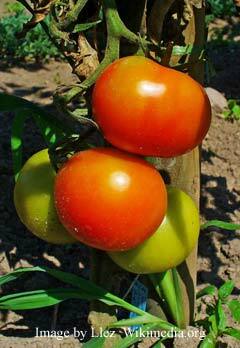 All Tomato plants should be mulched and watered as soon as the soil warms up. 8. If growing your Tomatoes in containers, take care not to overwater and do remember to add a Tomato fertilizer for extra feeding. 9. Remove sideshoots from the plants as they appear. This will help increase the size of the fruit. 10. When weather conditions are dry, ensure that the plants are watered once a week using around two gallons of water per plant.